Atlantic City Blackjack is considered as the “Diet Coke of Las Vegas” and it is usually on the list of top three casino table games where to gamble in land based casinos. The blackjack variant has become very popular and thanks to the introduction of online casinos nowadays it is available to blackjack fans from all parts of the globe. The game can also be found at some mobile casinos and it can be played on the go. Atlantic City Blackjack is played according to the standard rules for blackjack, but they are slightly modified. Continue reading to familiarize with the game and learn a few winning tips and hints. The rules of Atlantic City Blackjack are fairly standard regardless of which software providers’ game you play. Both the player and the dealer are given two cards and players make appropriate decisions. Two unique rules of Atlantic City Blackjack are the late surrender and the dealer checks for blackjack. Atlantic City Blackjack is played with eight decks of cards. The cards are shuffled before each gaming session. Players are allowed to split hands up to three times and by doing so they will be playing a maximum of 4 hands. Aces can be split only once and only one card will be dealt to each Ace. If players are dealt a card with a value of 10 to a split Ace, then the hand is 21 hand, not a blackjack hand. Any two cards that have the same denomination can be split, including 10-valued cards. Only late surrender is allowed in Atlantic City Blackjack. In other words, you can surrender your hand after the dealer has peeked for blackjack and you will lose half of your original bet. Players are allowed to Double Down after they have been dealt their first two cards regardless of what they are holding. They can also Double Down after a split. The dealer stands on all 17 hands. Since it is a hole card game, the dealer always peeks for blackjack if the up card he/she has is either an Ace or a 10. Blackjack is paid 3 to 2, while Insurance bets are paid 2 to 1. The house edge of Atlantic City Blackjack is 0.36%. Surrender when your hand totals 16 and the dealer has 9, 10 or 11. You should also surrender when you have a 15, while the dealer is holding a 10. Stand when you have a pair of 10s. Split a pair of 2s and 3s if the dealer has a card with a value between 2 and 7. If the dealer holds any other card, then hit. 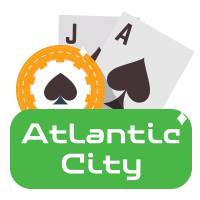 Microgaming, one of the online casino software pioneers, has developed online version of Atlantic City Blackjack which can be played in single-hand, gold and multi-hand formats. 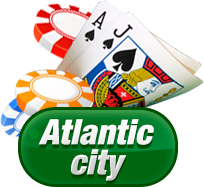 As the name implies, Single-Hand Atlantic City Blackjack is played between a player and the dealer and all of the above-mentioned rules apply. Atlantic City Blackjack Gold is different in terms of style, while the multi-hand version of the game allows players to play a couple of hands at once.